BACK ON THE GREEN: Chair of the Cherry Street Sports Club Dac Cameron with president of the Lennox Head Men’s Bowling Club Col Skennar as Lennox games commence at the Ballina club this week. BOWLERS from Lennox Head were back on the greens this week thanks to a deal struck with the Cherry Street Sports Club in Ballina. President of the Lennox Head Men's Bowling Club, Col Skennar, said 56 bowlers lined up to play in their Lennox Head colours for the Tuesday afternoon competition. And that, he said, was up on the regular numbers. The Cherry Street Sports Club opened its greens to the Lennox Head men and women after the Lennox Head club was shut by the Sydney-based Ramsgate Memorial RSL club on November 12, citing poor financial performances. Mr Skennar was thankful to the offer from the Cherry St club to allow the Lennox Head bowlers to play. "It's a great offer," he said. "It lets us keep our independence, and I won't say if, for when we get our own club." On Tuesday afternoon, the Lennox Head women's club had more than 30 bowlers registered to play on Wednesday morning. 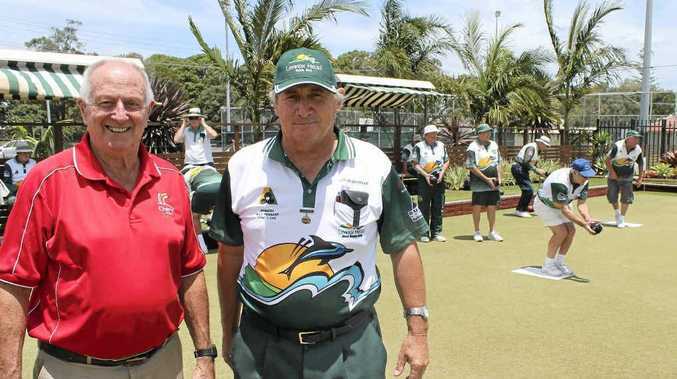 Chairman of the board of the Cherry St club, Dac Cameron, said the Lennox Head Men's Bowling Club was one of the most successful clubs in the Northern Rivers. "They must keep their identity," he said. The Ballina women's club had to start its weekly games 30 minutes earlier on Tuesday morning to allow the Lennox Head games to go ahead that afternoon. But Mr Cameron said: "I don't know anyone who isn't supporting this issue". The Lennox Head games will be played on Tuesday and Wednesdays indefinitely. Meanwhile, the Cherry Street Sports Club is gearing up for the 50th Summerland Singles and Summerland Pairs events to be played over the Christmas-New Year period. Nominations for the events close early next week.